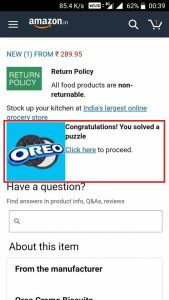 Amazon Oreos Maze: Solve Clues & Win Rs 5000 Amazon Pay Balance (Answers Added)!! – Here is one more Quiz Contest from Amazon and this time it’s similar to the Amazon Treasure Hunt. Amazon Oreo Maze Contest where you will be given clues and you have to guess the products. This is really simple and we are also adding the answers of those clues below. So you just need to claim those products to answer the clues and this way you can participate and stand a chance to win the prizes. Let’s check it out. 1. First of all, Download or Update Amazon App. 2. Install, Open & Login or Sign up in the app with Amazon Account. 4. You will see the details. There are total three clue packs each having 5 clues. Solve each clues in all the three packs. So total 15 clues you have to solve. 5. Check each clue one by one, guess the product and visit the product page and at the bottom of the page, you will find an option to Claim your Clue (Congratulations! You solved a puzzle). Just click on Click here button to submit your clue answer. That’s it. Same way, submit all the remaining clues answers and you can win Rs 5000 Amazon Pay Balance. Further, customers from relevant pincodes who solve a maze correctly AND download the Prime Now app will have two entries each in the draw of lots to be eligible to receive Amazon Pay Balance worth INR 5000 (“Prize 1”) from the Brand. Lastly, from all participants who solve a maze correctly AND purchase the ‘Snickers Chocolate Bar, 50g (Pack of 5) ‘ product (“Product”) listed on Amazon.in / Prime Now app by third party sellers, 5 participants will be selected by a random draw of lots to be eligible to receive Amazon Pay balance worth Rs. 10,000/- from the Brand (“Prize 2”) provided that the eligible participant’s order for such Product should not have been cancelled or the Product should not be returned or refunded. Prize 1 and Prize 2 will be credited in the Amazon.in Amazon Pay Balance account of the winners on or before 31st August, 2018.